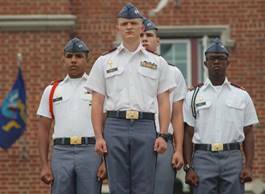 Fishburne Military School has been named to Virginia Living Magazine’s list of Top High Schools & Colleges 2014. Top High Schools & Colleges 2014 is a list of nearly 150 programs in public and private high schools and four-and-two-year colleges leading the way in innovation across the state. Virginia Living’s Top High Schools & Colleges 2014 recognizes schools for excellence and innovation in five categories: Arts & Humanities, Science, Math & Technology, Performing Arts, Health & Medicine and Capital Improvements. After thorough review of each school’s programs and accomplishments, Virginia Living’s editors selected schools that have instituted programs or recently begun capital improvements aimed at strengthening students’ experiences in and beyond the classroom. Virginia Living’s Top High Schools & Colleges 2014 is the resource for anyone curious about why Virginia’s schools are consistently ranked among the nation’s best. In the past two years Fishburne has launched a successful Science, Engineering, Technology and Mathematics (STEM) initiative, completed a number of IT and classroom technology upgrades, made over $1M in renovations to the physical plant, and continued a streak of 100% College Acceptance Rates that has lasted well over a decade.